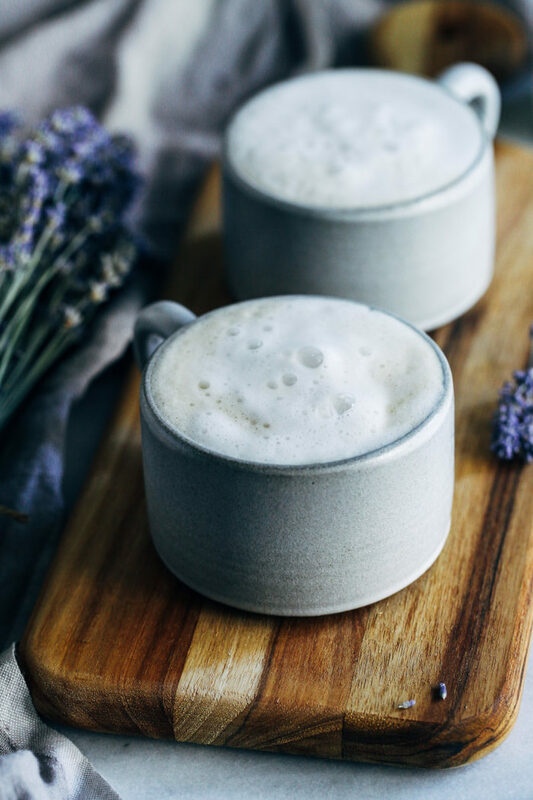 Cozy Lavender Vanilla Latte- a naturally sweetened lavender-infused latte that will calm and delight your senses. 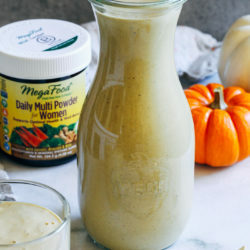 Made dairy-free with almond milk! I’ve never been much of a coffee drinker but if there’s one thing that’s hard for me to resist, it’s a good latte. Especially one made with lavender. The calming fragrance has a way of making me feel all cozy inside, instantly putting me in the mood to curl up on the couch with a blanket and a warm cup in my hands. 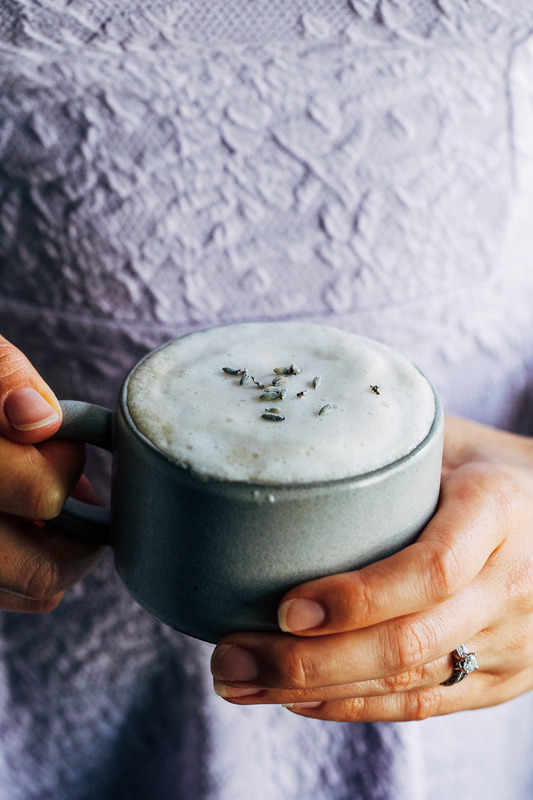 The first time I tried a lavender latte was at Watercourse Foods in Denver on our drive from California to Georgia. I still dream about how delicious that breakfast was. The biscuits and gravy and the almond flour pancakes were some of the best I’ve ever had. Man, what I wouldn’t give to have a restaurant like that here in Athens. 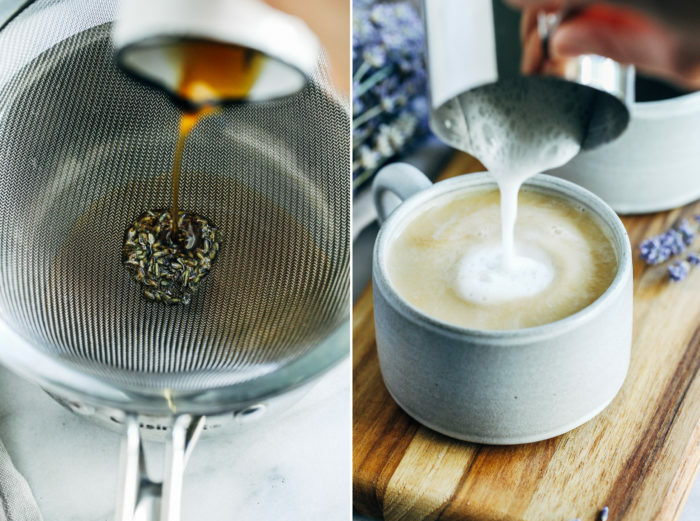 The good news is that it’s super easy to whip up some lavender-infused syrup and use it to flavor homemade lattes. 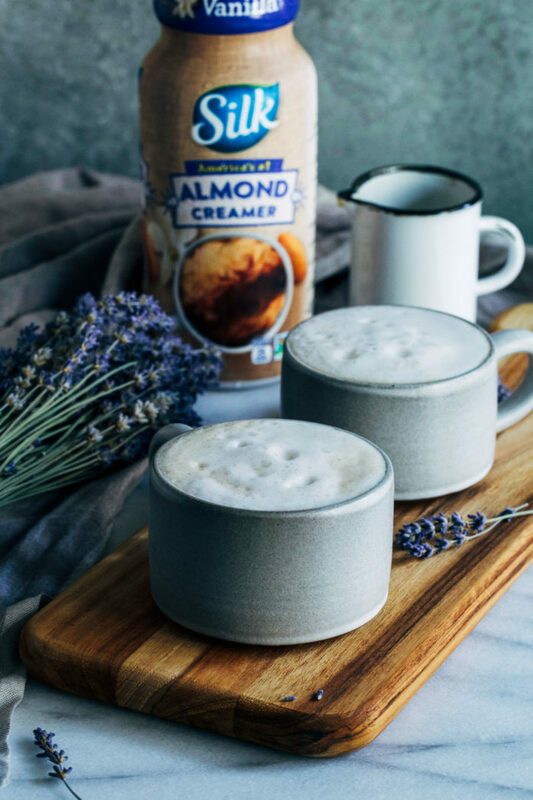 I paired the syrup with a splash of Silk’s Vanilla Almond Creamer which gives the coffee a hint of vanilla and a luxurious creamy texture without any weird or unnecessary additives. If you’re able to get your hands on some dried culinary lavender then I highly recommend infusing your own syrup. It’s so easy and you can use it for pancakes, waffles, tea…the possibilities are endless and oh so delicious. It’s perfect for savoring the last of summer and welcoming the cool fall days. Cheers to that! 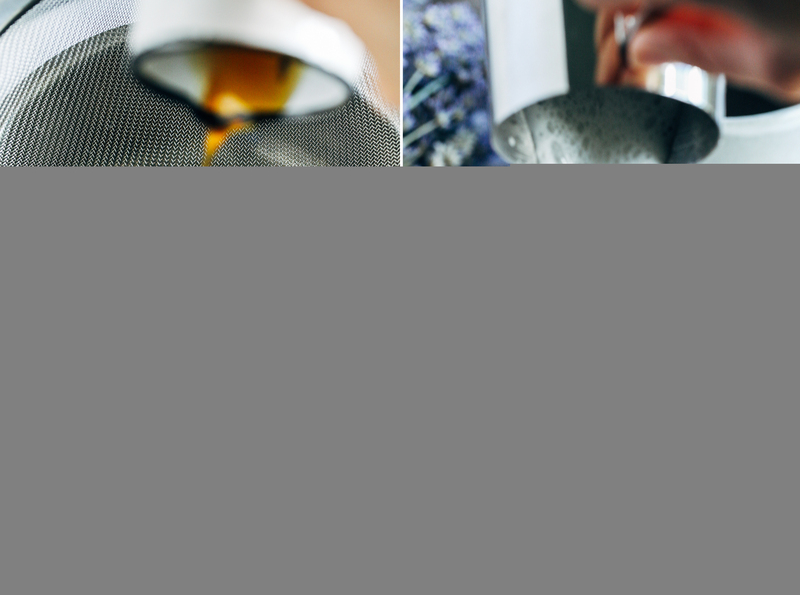 In a small saucepan, combine the syrup and dried lavender. Bring to a boil then reduce to a simmer and allow to cook for 10 minutes. Remove from heat then use a fine mesh sieve to separate the lavender bits from the syrup. Add the warm coffee to a cup for serving then stir in 1 tablespoon of syrup and vanilla creamer until well-combined. Steam or froth the almond milk and pour on top of coffee. Sprinkle top with dried lavender, serve warm and enjoy! This sounds delightful, and yes – cozy indeed! This is my first time visiting your blog and I love it, just added it to my RSS feed! 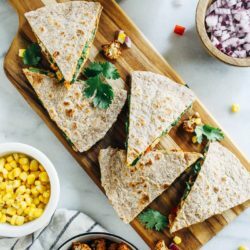 I love your food photography, it’s so pretty! And this recipe sounds amazing. I’ve never had a latte with lavender before, but I’m about to! Great job! 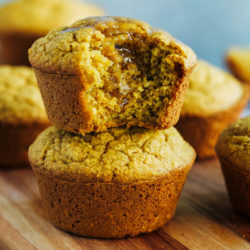 It looks such a tasty recipe! Do you add water to make the syrup or wouldn’t get burned in 10 minutes? And: I don’t drink coffee, can I use barley coffee (caffé d’orzo)? Hi there! You don’t need to add water. You just keep the syrup on low to simmer- it won’t burn unless you have the heat too high. I”m not familiar with barley coffee but it sounds like it should be fine to substitute. I hope you enjoy! I totally wish we had a Watercourse Foods here too! Those almond flour pancakes were just fantastic— I wish I knew how they made them. I’ve never had a lavender latte before but I’m so curious to try one now. This looks just so cozy! I know! 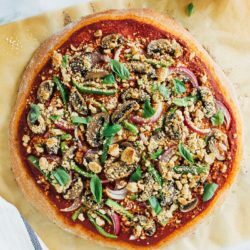 I’ve been trying to find something online with the recipe but no luck. They were perfection! Oh that’s so nice you live close to a lavender farm! I would drive there just to smell it, haha. This sounds so lovely! Sooo dumb question- I have lavender in my herb garden, but how do I know if it’s “culinary” lavender? I feel like you’ve talked about this before and I don’t remember…. Side note, I went to Living Kitchen for dinner last night and it was amazing! Yay! 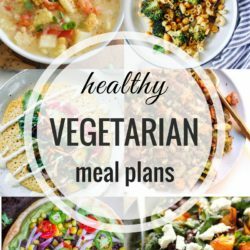 I’m so glad you got to try Living Kitchen! I had to go watch your IG stories to see as soon as I saw this comment, lol! Culinary lavender is usually varieties that are best for cooking but you can use any kind. I haven’t tried it with fresh lavender so I’m not sure how that would work but I think it should be fine. Or you can dry a few stems and use the dried lavender from that! 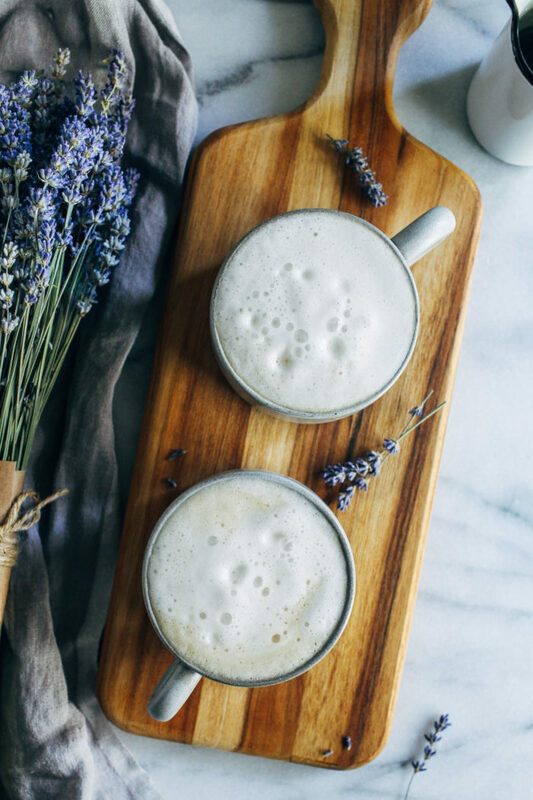 I’ve never seen a lavender latte and now I really want one! This looks so heavenly and your photos just make me want to curl up on the couch with one! Oh my, I’ve never tried a lavender latte before. It sounds intriguing! Yes I have thought about that too! Especially in Athens because they have local funding set up for new businesses. They are very big with supporting local companies here. But I’ve worked in the restaurant industry and I know how difficult it is for very little payoff. Not to mention the failure rate is over 50% or something. So I don’t know. It would be a big risk!